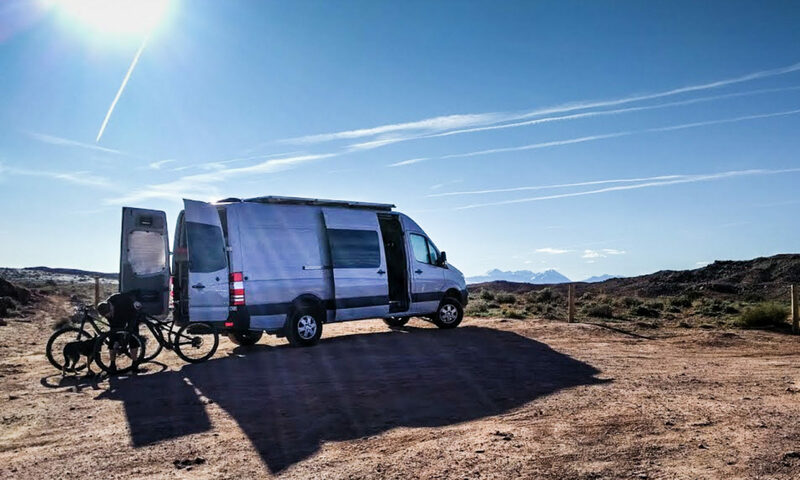 There’s a physical constraint to how much solar energy you can gather from your van. We thought we had it pretty much maxed out until we came across this Advanced-RV build that added even more panels. If you’ve already got stuff on the roof, like an air conditioner and Maxxair fan, that will limit how many panels (and what size) you can stick up there. There’s also an upper limit to how much energy it’s worth harvesting from the sun, based on the relative cost of the solar panels versus the time it takes to recharge your batteries. We worked out that we’d be happy with a solar system that recharged us from 60% to 100% on a sunny day. In other words, we wanted to be able to use 40% of our battery (300 Amp Hours) every day during the summer and still recharge completely. Everyone’s energy needs and solar requirements will be different, so it’s worth giving some thought to how much solar you actually need. How much solar charging do you need? The first step is to work out how much electrical power you’ll use each day and then decide what size battery bank you want to install. Next, work out how much of that battery bank you need to recharge with solar versus other charging methods like the van’s engine or shore power. Depending on where in the world you live, you’ll need a different size solar array to catch that much sunlight. We wanted to be able to camp indefinitely during the summer, so we decided we should be able to replace a regular day’s usage during a sunny day. We don’t currently have any charging system from the engine (like a battery combiner or DC-to-DC charger), so all of that replacement energy has to come from the solar panels. How much energy will you use every day? First calculate your electrical usage needs. This is something you need to do anyway to avoid big surprises after you’ve installed everything and you realize you don’t have sufficient batteries to power it all. This is the point where you work out whether it’s even worthwhile trying to use electricity to power all your systems, or whether a propane system or diesel cooktop might reduce your electrical needs. How much energy can you replace with solar panels? Solar panels don’t always produce the amount of energy they are rated for. Our 795 Watt system will maybe get to 600 Watts instantaneous energy collection for the brightest part of a very sunny day. That translates to 0.6 kWh. 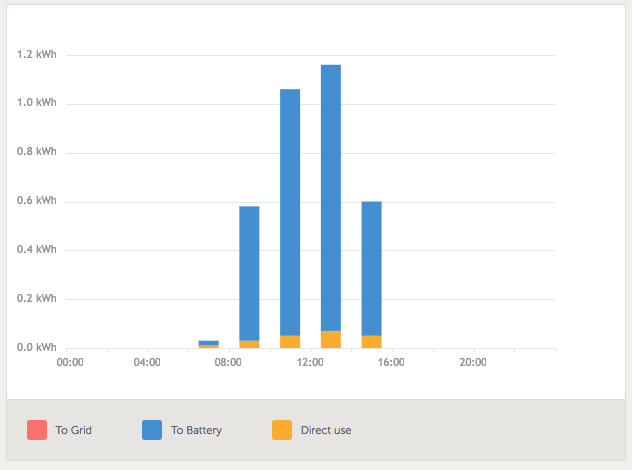 The graph below has bars that are two hours wide, and the mid-afternoon bar is just under 1.2 kWh. You can see how quickly the amount of energy ramps up and drops off during the day as the strength of the sunlight changes (we were parked up in Central Oregon). The National Renewable Energy Laboratory PVWatts site has a highly configurable calculator that tells you how much power you’ll actually get from your solar installation at a given time of year, based on where you are around the world. What it’s likely to tell you is that even if you’ll be fine in the summer, come winter the panels might not give you that much juice. You might decide that’s OK though. Either you’ll overwinter in Arizona, or plug in to shore power during the winter, or change your usage habits so that you don’t consume as much power. Or, you might decide to size your solar panels for the worst case scenario. That’s easier to do on a house than it is on a van though with limited roof space. It’s also expensive. What other charging sources and energy sources do you have? Although we wanted solar to be our main charging source, we still have a shore power connection. We also carry a butane camp stove. We ran cables to use an engine charging system too, even though we haven’t installed it yet (and may never do). All of these other charging methods and energy sources have a cost associated with them. It’s up to you to compare the cost and benefit with the cost of solar panels. Most van conversions end up using more than one kind of power supply or charging system. In the end, we realized that winter camping is not going to be the same for us as summer camping. Either we’ll charge up from shore power before we leave, knowing that we’ll be running the battery down over a couple of days, or we’ll install an engine-based charging system to augment the solar panels. Either way, we’ll also be much more careful with how we use power in the van. For instance, using a portable propane or butane stove rather than the induction cooktop and electric kettle. What you’re doing when you make this comparison is deciding how much of your daily power usage you intend to replace with solar. Some people just install enough to keep their core systems (fridge, fan, lights) running. Others, like us, want enough solar power to cover all of the regular electrical needs. Even then, we aren’t planning on taking long, hot showers powered by a battery-driven electrical water heater, or cooling the van using a battery-powered air conditioning unit. Now you can decide how many solar panels to install! Once you’ve worked out your energy needs, how much energy solar panels can replace for you, and the relative costs of solar versus other charging and energy sources, you’re in a much better position to decide what size solar system will work for you. The next step is to consider exactly what panels you’ll buy, how you’ll mount them, and how you’ll get their power in to your electrical system. Here’s what we chose for our build. Did you custom fab your wind fairing? It looks great! Thanks Sam – the front fairing is a piece of aluminum siding trim left over from our barn. The side fairing under the solar panels is ABS plastic heat-moulded into shape. Here’s more on the front fairing and the side fairing.